Nissan Motor Co. is recalling roughly 841,000 Nissan March and Nissan Cube vehicles worldwide due to a dangerous steering wheel issue that may lead to loss of steering control. Affected by today’s recall are 841,000 vehicles sold worldwide, including all Nissan Micra vehicles manufactured in the UK and Japan between 2002 and 2006, and certain Nissan Cube models built in Japan during the same time period. The recall concerns vehicles sold in the Japan, Europe, Asia, Oceania, Africa, Latin America and the Middle East, but not the United States. According to a statement filed to the Japan transport ministry, affected vehicles may contain an improperly tightened steering wheel bolt, which may cause the steering wheel to malfunction. In some cases, the defect may cause vehicles to lose steering control. There have been no crashes, injuries or deaths reported, said Nissan spokeswoman Noriko Yoneyama. Nissan, which is Japan’s second-largest automaker, will repair the glitch by either tightening the bolts or replacing the steering wheel entirely. The recall will take approximately 40 minutes to perform. The car company has not announced when it will begin notifying customers of the recall. Thursday’s recall marks the second substantial recall issued by Nissan this year. In April, the automaker recalled about 480,000 Nissan and Infiniti vehicles worldwide because of a front passenger airbag inflator problem, which may cause the airbags to deploy with too much force. Consequently, the bursting airbag may start fires or send debris flying at passengers. The recall involved roughly 265,000 vehicles in the US; 137,000 in Japan; and an additional 78,000 in North America and Europe. The recalled models in the US were the Nissan Maxima, Pathfinder and Sentra; and the Infinti FX and QX4. The Japanese recall concerned the Cube, X-Trail, Maxima and Teana. Click here to read more about Nissan’s massive airbag recall. 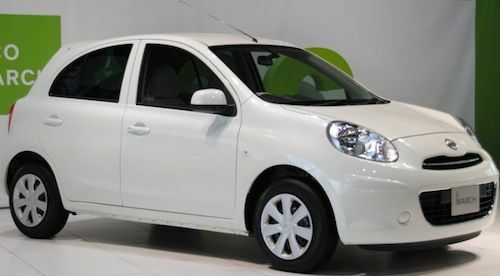 Also known as the Nissan March, the Micra is a supermini car produced by Nissan since 1982. A popular vehicle for over three decades, the Micra has continuously received high marks for its reliability, superior build quality, and user friendliness. The supermini car was the winner of the Wheels Magazine 2012 Gold Star Value award for best light car under $17,000. Introduced in 1998, the Nissan Cube is a mini MPV currently sold in Japan, North America and Europe. Now in its third generation, the Cube has won numerous accolades in including the 2010 Automobile Design of the Year Award and AutoPacific’s Best in Class Vehicle Satisfication Award. The vehicle was also named to Kelley Blue Book’s Top 10 Coolest Cars Under $18,000 and AAA’s list of Top Vehicle Picks for Dog Owners.